I have an elderly lady friend who is of ''old school' and always gives thank you cards no matter how small the occasion was. Whether it was being invited to lunch or simply giving her a lift. So I made these little cards for her. They are about 3 x 3" and made out of any spare scraps and random stamping, She loves them and they cost almost nothing. What a lovely gesture to do and one that has made someone really happy. 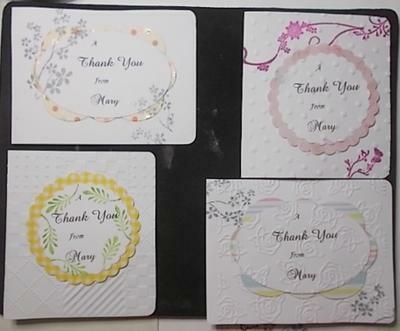 Many thanks for your kind comments on my cards Mary is very grateful for them as she feels they give an extra special personal touch, I shall make her some more soon. What BEAUTIFUL Thank You Cards! I don't think there is anything "old school" about sending Thank You Cards! Practicing gratitude seems to be a lost art in todays culture. I'm so happy and proud of you that you thought to do this for someone you care about. I am positive your thoughtfulness made her feel like a million bucks or (pounds - a lot of money) You must be a very kind and precious lady. Thank you so much for sharing your talents with us. Have a fabulous day. You made my day by sharing your story! What a lovey idea for you to make an elderly lady feel that at least she is appreciated, which I am sure she is. I am sure she values your friendship. These cards are all lovely and what a lovely gesture. I think it is a really lovely thing to do.